Heather is an award-winning author and nationally sought-after speaker spending much of her time passionately educating audiences about the fascinating world of native bees and the native plants that support them. Her first book, Pollinators of Native Plants, was published in 2014, and her latest book, Bees, published in 2017, has won six book awards including the 2018 American Horticultural Society Book Award. 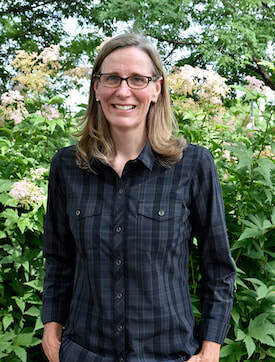 Heather's expertise includes the interactions between native bees and native plants, and the natural history and biology of native bees occurring in the upper Midwest and Northeast. In her spare time, she is an active community supporter, writing grants and coordinating neighborhood volunteer landscape restoration projects. Currently, Heather is working on three projects with volunteers, restoring approximately ten acres of city-owned land in her neighborhood for pollinators and people.